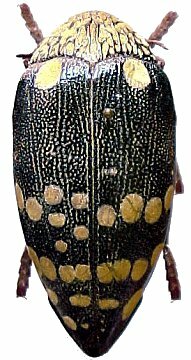 In this tribe we can find some of the most interesting, beautiful and large species among Buprestidae. This tribe is exclusive of the Ancient World, and its species live in Africa, South and South-East Europe, Middle Orient, reaching Turkmenistan, Afghanistan. Pakistan and the southern Oriental Region to the Indomalaysian region. Probably, its origins are in Southern and Eastern part of Ethiopic Region (Subsaharian Africa and southern Arabian peninsula), and their Asian and Mediterranean population are less ancient (many groups of species are actively evolving just now, and their systematics is not easy). Sternocera is typical of tropical regions of Africa and Asia. These species are very large and massive (from 3 to 6 cm. and more). 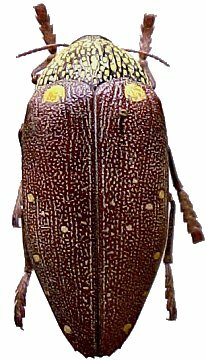 This genus seems intermediate between Sternocera and Julodis and ist few species are typical of South and East Africa. It is the most diversified and characteristic genus in this tribe. There are several species, mostly living in arid and semiarid lands of tropical and subtropical regions of Africa and East Asia. Others live in steppic areas of Eastern and Central Asia and in the southern part of Europe. It's possible to find Julodis also in place without trees and bushes, because their larval stages live free in the soil. This genus is closely related to Julodis. 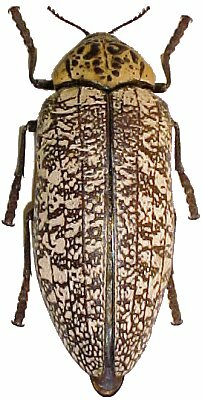 Just one species is known: Aaata finchi, living in Beluchistan (a desertic region belonging to Pakistan, Afghanistan and Iran) It is the largest Paleartic Buprestid (7 cm. and more), and perhaps in the World. 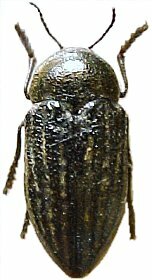 Another genus closely related to Julodis, with few species, typical of East Asia, from Turkey to Iran and Turkmenistan.